WHAT IS IT? I dreated this challenge: too girly for me. And now, guess what, I love it! I went for Japanese Cherry blossoms in whitish pink and pale pink on a black knobbly branch on a classic pale red background. WHAT IS USED? I used essie’s chubby cheeks as my main colour. I loved this pale red to death last spring and early summer but haven’t worn it as a complete mani ever since. It is quite red and red is not my favourite, maybe that is it. The mani is quite simple. Two layers of red nail polish, then I took my French nail pen in black and added the branch on my ring finger. Good thing is: cherry branches actually really are rather knobbly so never mind about shaky hands. And than I dotted this branch with lots of whitish pink flowers (essie, fiji) and painted every other blossom in pale pink (essie, eternal optimist). For this I just used the normal brush as I wasn’t aiming for neat dots but rather uneven blossom like shapes. 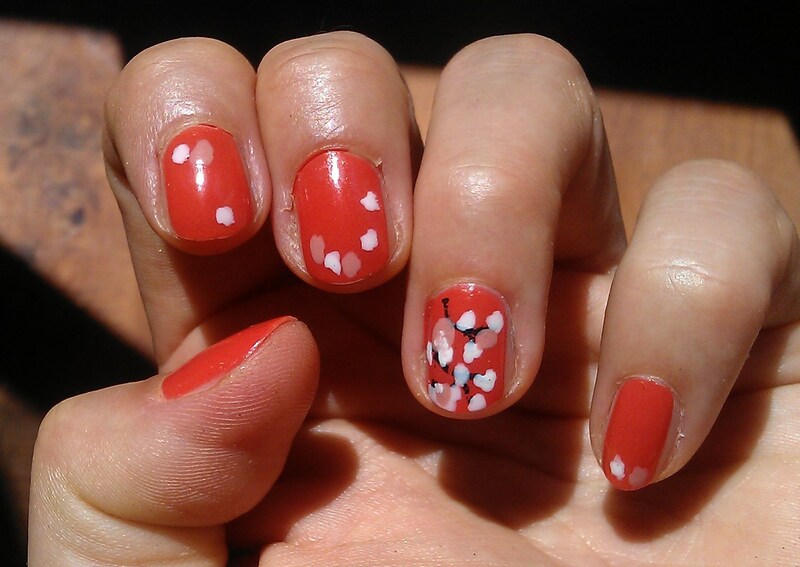 To complete the mani I added a few more blossoms on the other fingers just as if they had been blown of the branch. HOW DOES IT FEEL? Great. I absolutely love it. It is cute but in a good way. I could definitively keep that mani on a little longer but unfortunately the challenge is calling and I need to get going to make sure I covered all the days in advance that I’ll be on vacation. This entry was posted in Nail Art and tagged 31 day nail challenge, chubby cheeks, essie, eternal optimist, fiji, Nailpolish by kathatravelling. Bookmark the permalink.